Chapter 7 – Data collection and compilation Results of the second worldwide consultation. 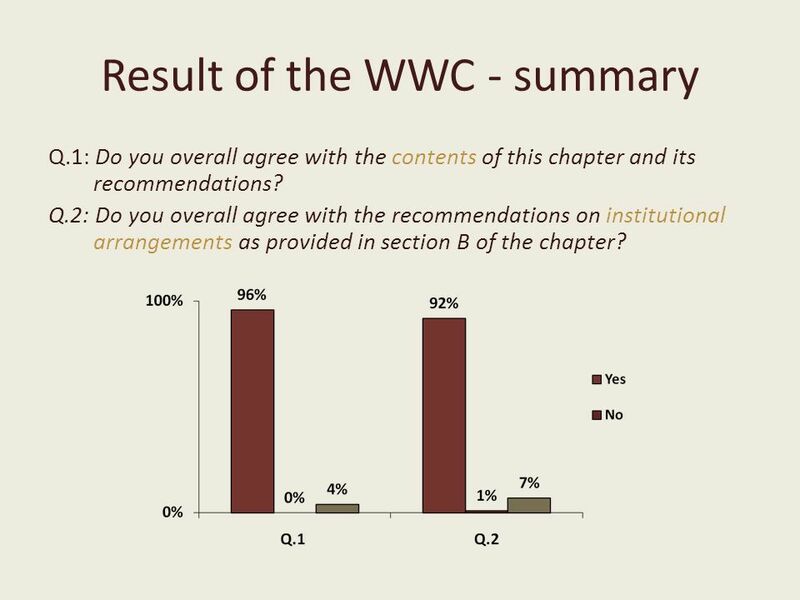 4 Result of the WWC - summary Q.1: Do you overall agree with the contents of this chapter and its recommendations? Q.2: Do you overall agree with the recommendations on institutional arrangements as provided in section B of the chapter? 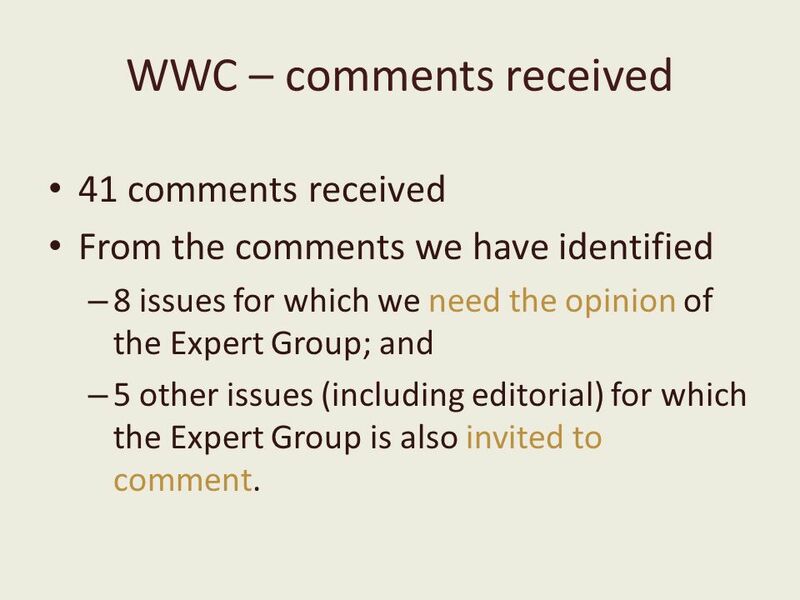 5 WWC – comments received 41 comments received From the comments we have identified – 8 issues for which we need the opinion of the Expert Group; and – 5 other issues (including editorial) for which the Expert Group is also invited to comment. 6 Discussion A list of issues brought up by the respondents to the 2 nd WWC has been prepared and presented to the Expert Group. 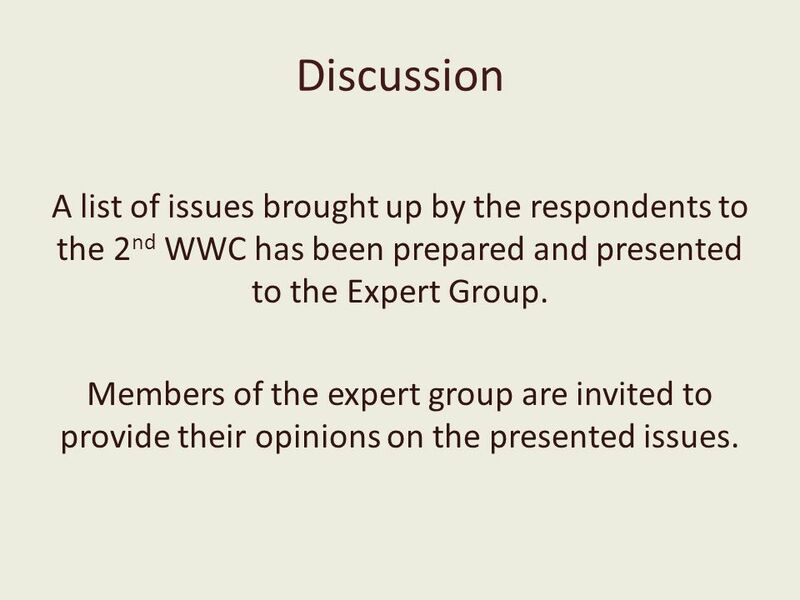 Members of the expert group are invited to provide their opinions on the presented issues. Download ppt "Chapter 7 – Data collection and compilation Results of the second worldwide consultation." Eurostat Task Force on Land and other non- financial assets Progress report and request for AEG advice Hans Wouters ESTAT, unit C.2. 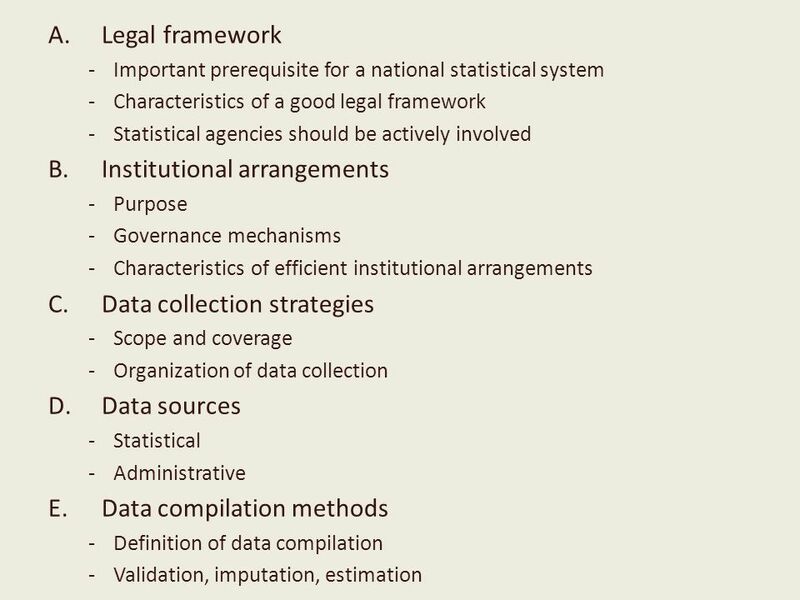 Chapter 6 – Statistical Units and Data Items Results of the second worldwide consultation. 13 September 2005, Panama Workshop on Compilation of Statistics of International Trade in Services 1 Purpose and Overview Workshop on Compilation of Statistics. 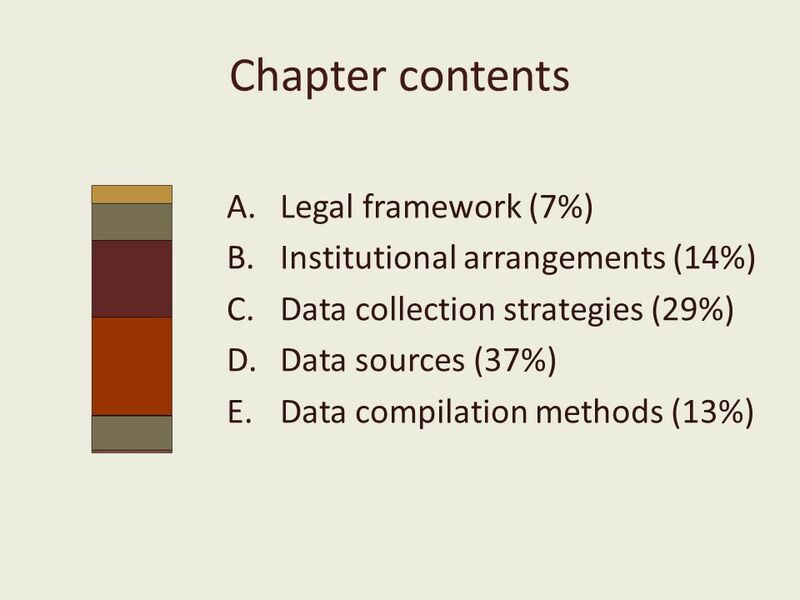 Chapter 9 – Data quality assurance and metadata Results of the second worldwide consultation. Country-led impact evaluation: A survey of development practitioners Denis Jobin Vice-President IDEAS. HELPING THE NATION SPEND WISELY Performance audit and evaluation: common ground with Internal Audit ? The UK National Audit Office experience Jeremy Lonsdale. Performance Information Audit Measurement of results of activities with respect to objectives and indicators determined by public administrations within. United Nations Statistics Division Review of the Implementation Guide to ISIC Rev.4. Towards Standard International Energy Classification Vladimir Markhonko United Nations Statistics Division. Workshop on Energy Statistics, China September 2012 Institutional Arrangements and Legal Framework 1. Chapter 2 - Legal foundation and institutional arrangements 8 th Meeting Baku, Azerbaijan September 2013 Drafting process of the Energy Statistics. Enhancing Data Quality of Distributive Trade Statistics Workshop for African countries on the Implementation of International Recommendations for Distributive. United Nations Oslo City Group on Energy Statistics 8 th Oslo Group Meeting, Baku, Azerbaijan September 2013 ESCM Chapter 8: Data Quality and Metadata. Chapter 5 – Energy Flows Results of the second worldwide consultation. Federal Department of Home Affairs FDHA Federal Statistical Office FSO Guidelines of Statistical Business Register Draft chapter 7 Fabio Tomasini – Paul.